2018 was an interesting year for the diamond world. Enormous amounts of attention was paid to what is, in reality, a fairly small segment of the industry. Back in March 2018, De Beers, the much-maligned diamond juggernaut announced their impending entry into the lab-grown diamond market with a “fun” jewellery line called Lightbox. This really put a cat amongst the pigeons. To say the least, purveyors of mined diamonds felt betrayed. How could De Beers, the long term champion of the mined diamond industry suddenly get into bed with the test-tube-toting ‘dark side’? Salt was rubbed into the wound when, in June, the United States’ Federal Trade Commission (FTC) changed the rules on how mined and lab-grown diamonds must be described. In short they acknowledged that lab-grown diamonds are, in fact, diamonds. They could be described as such so long as they carried a qualifier like ‘lab-grown’ or ‘lab-created’. Mined diamonds, in turn, could simply be described as ‘diamonds’, with no qualifiers. And with the mined diamond industry no longer being allowed to describe lab-grown stones with inaccurate terms like ‘artificial’ or ‘synthetic’, let’s just say they weren’t particularly happy. De Beers didn’t actually launch Lightbox until September. Leading up to that there was a considerable amount of speculation as to why they had entered the lab-grown diamond space and what it would mean for the rest of the industry. Whether or not this was an intended consequence we’ll never know, but one thing’s for sure, more consumers know about lab-grown diamonds than ever before. You don’t have to look very far to find dozens of industry and mainstream press articles on the subject of lab-grown diamonds, De Beers and what’s going on. Have De Beers created a monster by mistake? Maybe? But maybe not? In our own neck of the woods, in the 10 years preceding 2018 you could count on one hand the number of enquiries we recieved about lab-grown diamonds. These days, enquiries about them are commonplace. Under the circumstances it was reasonable to expect there might’ve been a major adjustment in lab-grown diamond pricing. But that really hasn’t materialised. But Lightbox was only released in the USA, and it was targeted well away from the fine jewellery and bridal markets. As a result the impact on the diamond market overall has been fairly negligible. Have lab-grown diamond prices come down? Short answer, yes. But not by much. Reports are they might’ve dropped by about 10% since early 2018. Interestingly, mined diamond prices have come down somewhat too – due largely to soft demand in the United States. Interestingly, the higher end lab-grown diamond producers have been noticeably quiet over the past 10 months. Apparently being content to step back and watch what happens. They certainly don’t seem to have been put off by the De Beers move. Wholesale prices have barely shifted, especially in the bridal and fine jewellery market. Production volumes are actually projected to grow at the rate of around 10-15% per annum. Some of the diamond industry heavy weights have pushed back pretty hard, and many small bespoke jewellers are worried that lab-grown diamonds are going to push their profitability down. Similarly, advocates of artisanal small diamond mining in developing countries have expressed concern that lab-grown diamonds might adversely affect the lives of already disadvantaged miners. Otherwise, retailers – particularly in the United Kingdom and Europe – appear also to be welcoming lab-grown diamonds with open arms. They appeal to the environmentally conscious Millennial market, offer a value-for-money product that makes diamond jewellery now more affordable than ever and, frankly, they’re something new to talk about. When it comes to disruptive developments in places like the jewellery industry, Australians tend to be relatively slow adopters. Lab-grown diamonds certainly aren’t getting the traction here that they are overseas, but the early signs are this will change. Of course we have our own anecdotal evidence to show that interest in lab-grown diamonds is increasing. But we also keep an eye on search trends on Google and more an more people are investigating lab-grown as a mined diamond alternative. As we’ve mentioned in the past, we welcome lab-grown diamonds to the market – with a caveat. We are only interested in suppliers with good environmental credentials. Producing diamonds in a laboratory is very energy intensive, so off-setting the carbon cost is very important from our perspective. There are all sorts of social and environmental problems with the mined diamond industry, forcing us to be extremely selective with our suppliers. Unfortunately ethically sound mined diamonds also carry a premium price, so lab-grown diamonds allow us the opportunity to offer a responsibly produced product at a much more affordable price. We’ll continue to monitor the situation, but most certainly lab-grown diamonds are here to stay. 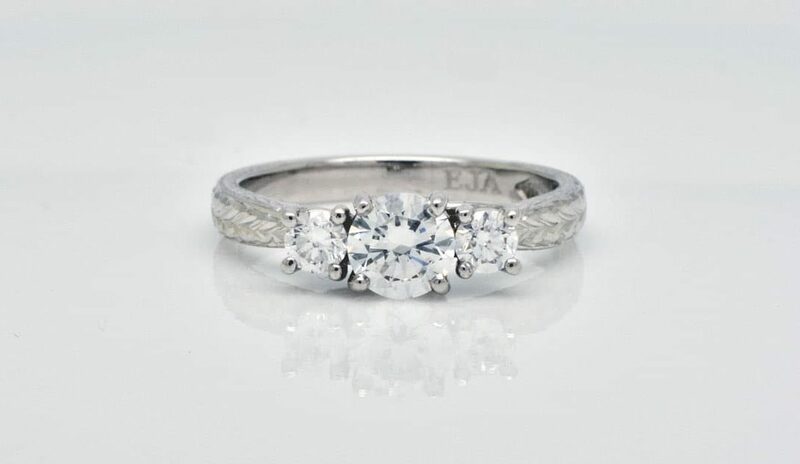 Ethical Jewellery Australia is an online engagement, wedding ring specialist and bespoke jewellery specialist. Every piece we do is custom designed and made to order. Benn co-authored the original Engagement Ring Design Guide in 2014 and edited the 2nd Edition in 2018. He is also the principle author of our Wedding and Commitment Ring Design Guide.